Not ready for the great outdoors? At least prepare your garden for summer cooking with the BBQube outdoor natural stone kitchen unit. Outdoor kitchens and grills have become an essential component of outdoor gatherings by providing tremendous style and increased practicality. BBQube makes no exception to these rules! 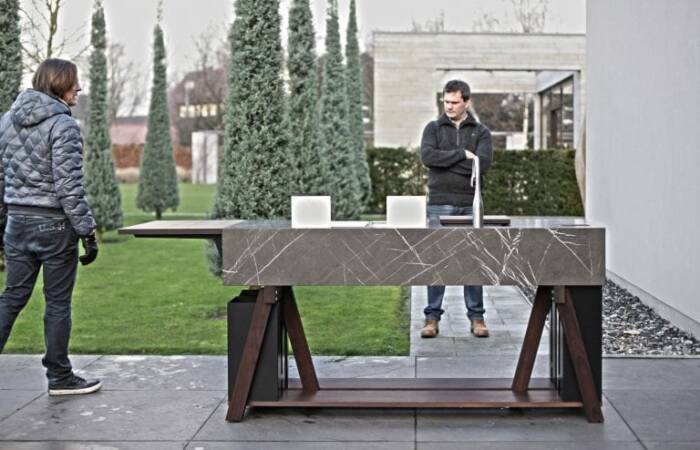 Composed of limestone and stainless steel, designer Michael Schmidt’s outdoor BBQube stone kitchen unit rests on two three-legged trestles made of solid wood – but looks more like an indoor kitchen in its original form. You may not know much about Michael Schmidt, but here’s and interesting fact that will make you look at the BBQube stone kitchen unit with different eyes: The designer started his career at Mercedes Benz and back in 1994 he is the person that redesigned the AUDI logo. Other then this, his furniture pieces are among the best German furniture designs on the market. 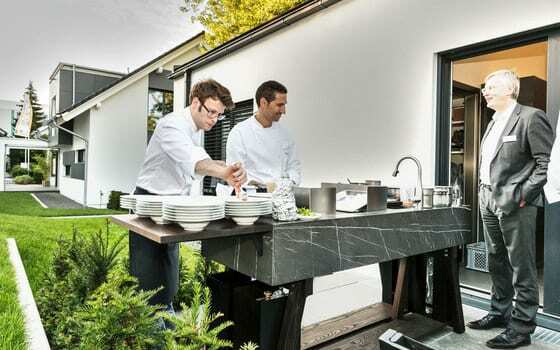 Germany-based designer intended the OCQ piece to blend the art of barbecuing with the entire process of cooking. BBQube its not only made for barbecue, but also tries to mix the entire process of cooking, food preparation and enjoying meal outdoors. Nowadays when outdoor kitchens are becoming more and more popular, OCQ designers come with a product intended to meet the demanding requirements of outdoor furniture and kitchens. The change is mainly due to the fact that a lot of people are trying to upgrade the familiar barbecue experience into something a little more elegant and comfortable. And main consumer concerns are related to the use of superior quality materials that last longer, ecological production and competitive prices, arguments that are fully met by the OCQ barbecue unit. Planning for an outdoor living area can take time because there are several important factors to consider, budget and available space being the most important. But having your own kitchen outdoors, will take your cooking, entertaining and lifestyle to a whole new level. This is a unique celebration of garden, patio or roof terrace cooking, with the design of the bbqube garden kitchen playing a pivotal and fundamental role.